John Frederick Lewis (1860-1932) was a Philadelphia collector of writing examples: he was interested in the history of the written word and amassed some of the most significant collections in the United States. A man of modest means who could not afford to go to college, Lewis became a lawyer (passing the bar was the only requirement at the time) and married into a wealthy family. In addition to the cuneiform tablets, it should be noted that Lewis also collected “Oriental” manuscripts (manuscripts from the Middle and Near East, as well as from Africa) and European manuscripts, of which he collected over 200 codices and over 2000 leaves and cuttings. While his widow, Anne Baker Lewis, donated Lewis’s manuscript collections to the Free Library of Philadelphia after his death, Lewis himself gave the cuneiform tablets to the Library: he personally brought groups of tablets to the Library in installments. At one time, tablets in the Lewis collection were made available for check out by individuals who might be able to translate them. Of course, the tablets do not circulate now! The Free Library of Philadelphia’s Rare Book Department is very grateful to Grant Frame, Ph.D., and Richard Zettler, Ph.D., both of the University of Pennsylvania, for all their help in identifying and placing many of these pieces. The Department is also grateful to Maria DeJong Ellis, Ph.D., the Cotsen Family Foundation, and Caroline Waerzeggers, Ph.D., for allowing us to use their scholarship and insight. Nearly 1200 tablets are from the Ur III kingdom of Babylon, but there are tablets from Sumer, Akkad, and other Babylonian kingdoms. 1. Royal inscriptions, which include building of temples, accounts of wars, and others. 2. Business and legal documents. 3. Letters and school texts. Group I: about 1400 items from ca. 3000 B.C.E. to 2300 B.C.E. The greater part of the collection belongs to this first group. Most of them are from the Third Dynasty of Ur, around the 22nd century, B.C.E. (c. 2100-2000 B.C.E.). The language of this group is Sumerian. Group II: about 1,000 items from ca. 2300 B.C.E. to about 1900 B.C.E. This group of artifacts are from the Isin, Larsa, and Babylon dynasties of the time of Hammurabi, about the 20th century, B.C.E. The language of this group is Babylonian. Group III: about 300 items from 800 B.C.E. to 300 B.C.E. In language and in script, this group is of the Neo-Babylonian or the Persian period. Mesopotamia is a word of Greek origin that means “between the rivers.” It lay between the Tigris and Euphrates Rivers, in what is now Iran and Iraq. The very first civilizations known to man emerged and flourished in this part of the world. The kingdoms of Akkad, Ur, Isin, Babylon, and Assyria supplanted each other in controlling most of the area from the third through the first millennia, B.C.E. They were succeeded by the Achaemenid, Parthian, and Sassanian Dynasties of ancient Persia. Tracing the timelines of these peoples is not an exact science. The early rulers of Mesopotamia were powerful kings of separate city-states. At times a king of one city might control several other cities as well, thus dominating the area between the Tigris and the Euphrates. Several kings could be powerful at the same time, and so the timelines often overlap with each other. The existence of Sumer was only discovered in the latter part of the nineteenth century. The archaeologists who discovered it were looking for artifacts from ancient Babylonia and Assyria. Greek and Hebrew sources mention the Babylonians and Assyrians, but Sumerians were “summarily” forgotten for over two thousand years. 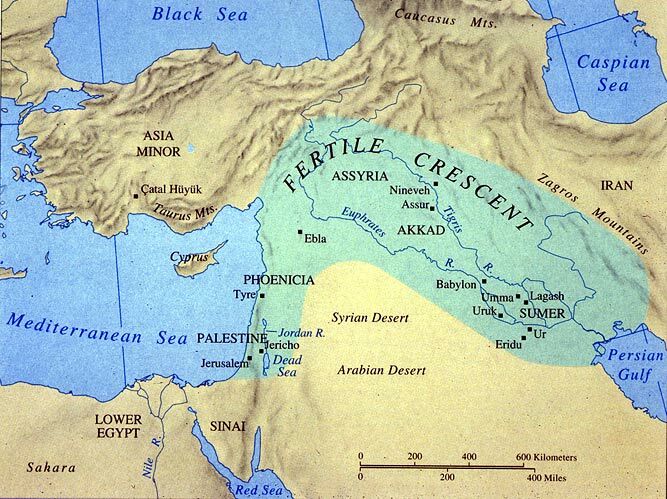 Sumer is called the “Cradle of Civilization” because the Sumerians developed writing, agriculture, the arch, and irrigation. They inaugurated the first systems of education, literature, and poetry. This people controlled Mesopotamia from around 3000 B.C.E. until they were conquered by Sargon and the Akkadians in 2334 B.C.E. The city of Babylon gave its name to two important periods in Mesopotamian history. The First Dynasty of Babylon, from around 1894 until 1595 B.C.E., was founded by Sumu-abum. Eventually it encompassed the regions of Larsa, Isin, Eshnunna, and Assyria. This dynasty is also referred to as the Amorite Dynasty, because Sumu-abum was an Amorite. Hammurabi, one of the most famous Mesopotamian rulers owing to his code of laws, was the sixth Babylonian king in this dynasty, and he expanded his initial control of Kish, Sippar, and Borsippa to Uruk, Isin, and other major cities. By the end of his life, Hammurabi ruled all Mesopotamia. The second Babylonian period is referred to as the Neo-Babylonian period, from around 625 until 539 B.C.E. The best-known king of this period (from Biblical fame) is Nebuchadnezzar II. The Hittites destroyed Babylon sometime around 1595 B.C.E., and Babylon did not regain its former glory until Nebuchadnezzar II came to power around 605 B.C.E. Babylon’s new buildings constructed during the so-called Neo-Babylonian period remained intact through antiquity. Babylon retained importance as a trading center during the Persian Seleucid dynasty. The earliest writing in the history of mankind was developed at the end of the fourth millennium B.C.E. in what is now southern Iraq. At this time, Mesopotamia was dominated by the city-state Uruk, which gives its name to the entire period. The Uruk period of Mesopotamia extended from the Chalcolithic (Copper Age) to the early Bronze Age, around 4000-3000 B.C.E. It was during the Late Uruk period that cuneiform writing emerged. The Late Uruk and Jemdet Nasr terms are archeological ones: they differentiate between two different layers of dirt as one excavates. The Late Uruk level is about four layers below the surface of the ground, whereas the Jemdet Nasr level is three layers. Jemdet Nasr takes its name from an archaeological site in today’s Iraqi Babil Governorate, and the earliest tablets have been excavated at this site. During this period there was a significant increase in the population, and the cities of Uruk and Susa grew and became powerful. Because of the increase in trade between cities, there was a need for documentation of exchanges of assets, hence the necessity of written records. Most of the tablets from the Jemdet Nasr site were unearthed from 1913 to the present: around 5,000 tablets have been excavated so far. First, clay would be unearthed where it naturally occurred. It would be washed clean of impurities and debris. A scribe (writer) would write in the soft clay with a stylus made from a reed. The tablet dried quickly in the sun or in the air. This writing system is called cuneiform (from the Latin for ‘wedge’—cuneus; and ‘form’—forma) from the wedge-shaped design made by the stylus. Some tablets were baked in ovens, but most did not need baking. After thousands of years of being buried deep in the ground, the tablets need to be kept from quickly air-drying when unearthed. If they dry too quickly, they can crumble into dust. One method of keeping unearthed tablets from crumbling is to wrap them in paper, and then leave them in the shade for around 15 days. This slowly air-dries them to the original, smaller size (clay shrinks when it dries). Sometimes the tablets are additionally baked in a kiln to further ensure preservation of their shapes and writing.